You had a busy week, busier than usual because you paid a visit to Suffolk Glass in Long Island for windshield replacement. Your windshield became damaged when debris got kicked up on it and caused a large crack. You were smart in getting it replaced right away because a cracked windshield is not a safe windshield. Anyway, after a busy week, you are looking forward to the weekend. And what makes this weekend special is that it is Super Bowl weekend! Best still is that you are planning on throwing a Super Bowl party for a few of your friends. That’s awesome and we are sure it will be fun. If you want your Super Bowl party to be epic, you need to follow these tips. A party isn’t really a party until people actually show up. Never assume that your friends are just going to swing by and knock on the door. What you need to do is either send out a formal invite in an email or text or post social media about your upcoming Super Bowl party. Just remember to not invite that guy at work who blames the referees every time his team loses. If you have anything smaller than a 50-inch television, we suggest a trip to Best Buy right away for an upgrade. Look, a 25-inch television in the 1980s was considered huge, but the stakes have been raised since then and the bigger the screen, the better the view. Look, if you stick to burgers and dogs and maybe some BBQ chicken at your Super Bowl party, it will be a party that most will describe as OK. If you want your party to be epic, something that people talk about on social media for months, then the food you serve needs to be epic. This means you need to serve bacon-wrapped cheesy jalapenos, bacon stuffed cheesy potato skins, loaded nachos, avocado fries, tater tot and bacon kabobs and buffalo wings. And you can’t leave your vegetarian friends or healthy eater high and dry either, you need options they can indulge as well. And just so you know, anything wrapped in bacon is a sure hit, even if it is a vegetable. It’s fine if you want to have a keg, but you also need wine and all of the fixings for a few cocktails. You will also want a selection of non-alcoholic drinks for those who don’t drink alcohol, tea, lemonade and sodas are fine. Everybody knows that kids have zero interest in the Super Bowl and all they will do is stand around eating too much and whining. At least, that is what your guest’s kids will do, your kids are perfect angels. If you are going to allow kids at the party, make sure you have games or other activities ready so they stay occupied. 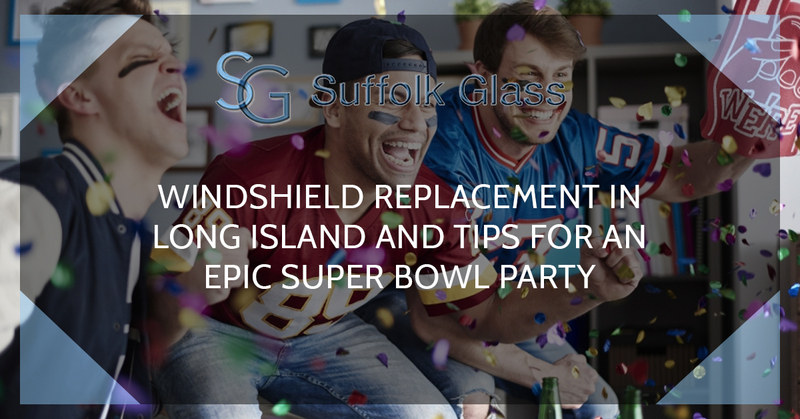 Lastly, tell everybody at the party what a great deal and great service you got at Suffolk Glass and tell them to visit our website if they need windshield repair or replacement.